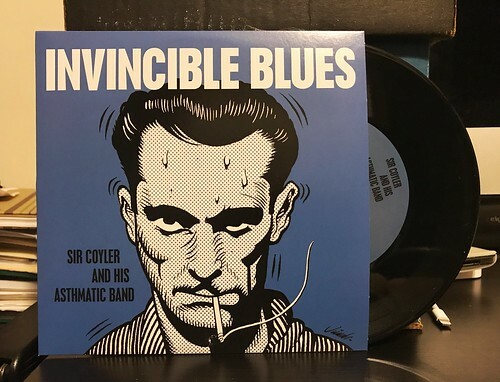 I Buy Way Too Many Records Dot Com: Sir Coyler and His Asthmatic Band - Invincible Blues 7"
Sir Coyler and His Asthmatic Band - Invincible Blues 7"
Anyway, back to Sir Coyler. A side "Invincible Blues" is a stone cold smash of garage-y energy. The song is built on this excellent guitar riff that pops in and out of the song accentuating each verse and transition. It's the sort of riff that gets stuck in your head for years and makes you try to think of ways to steal it without anyone else noticing. The B side "Pink & Blue" is more subdued, taking down the tempo and fervor, but adding in a bit more melody. It's a strong and catchy song, but I'll admit to enjoying the unchained energy of the A side a bit more. Regardless of which song I prefer, both a quite good and seem to be a big leap forward from their last EP. I know I'd like to hear more. Votzco - Run Away 7"
Wood Chickens - Skunk Ape 7"
Static Eyes - The Thaw 7"
Smalltown - Fall Into Line 7"